Officially unveiled earlier this month at IFA 2016, Sony Xperia X Compact can now be pre-ordered in the United States. Pre-orders for Sony's smartphone opened in Europe soon after its announcement, and in some countries it's already arrived for quite some time. 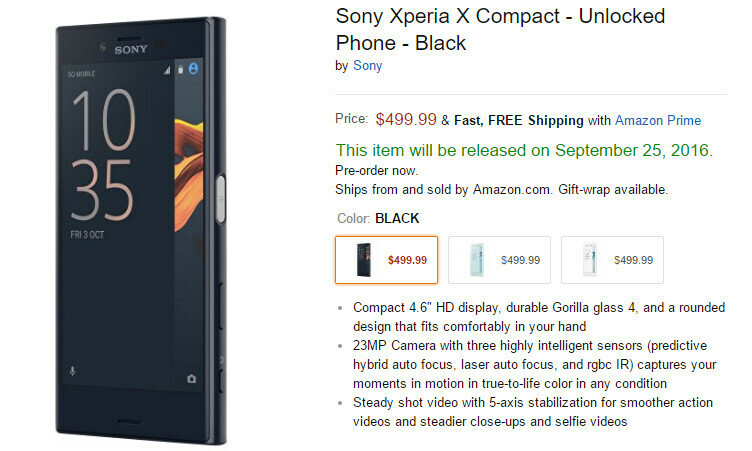 Anyway, Sony is now selling the Xperia X Compact in the US through Amazon.com where customers can pre-order one for $499.99. The unlocked version of the smartphone can be had in three color options: Mist Blue, Universe Black and White. Although you can now pre-order the Xperia X Compact via Amazon, the smartphone won't arrive until September 25, so there are still a couple of days that you'll have to wait to get your device. It's also worth mentioning that customers who pre-order the handset will also receive $50 credit on checkout, which basically means that the Xperia X Compact costs just $449.99 outright. As many of you probably know by know, the US version of the Xperia X Compact comes with a disabled fingerprint sensor. However, if you really want this feature, then you can certainly enable it by flashing a different ROM. In Europe, the fingerprint scanner is enabled by default, so there's no need to experiment with any Xperia ROMs. If you're still on the fence about buying Sony's smartphone, then you can check out our Xperia X Compact hands-on. Aside from the fact that the fingerprint scanner is disabled in the US version, the smartphone is similar to the global model. This means that it sports the same 4.6-inch display that supports HD (720p) resolution, as well as 23-megapixel rear-facing camera with Sony IMX300 sensor and f/2.0 lens. Also, the Xperia X Compact is powered by a hexa-core Qualcomm Snapdragon 650 processor clocked at 1.8GHz, coupled with 3GB of RAM and 32GB expandable memory (up to 256GB). The phone drains energy from a non-removable 2,700 mAh battery, which features Quick Charge 3.0 technology. Software-wise, the Xperia X Compact ships with Android 6.0.1 Marshmallow right out of the box, but an Android 7.0 Nougat upgrade is likely to be provided in the months to come. If you haven't tried a product, then technically you couldn't really know if you would like it or not. In this case you wouldn't know if you like Sony's phones or not without first owning one. yea Xiaomi starts metal body SD 650 sets with FPS, well below $200. I have a Z3C and was hoping to find this at a more affordable cost. So the fingerprint sensor is there, it's just disabled... Come on Sony! You can enable it by rooting it and you'll be able to use your fingerprint sensor whenever you want. Its not that hard. I rooted Z3c without unlocking bootloader aka without affecting camera. I don't know if its the same on later xperias but i think so. Im sure many will be interested in this phone instead of the S7 for the same price, great marketing strategy as always Sony. The S7 cost more so they acually might if they want a compact phone. The S7 has more RAM and a better chip and a bigger battery I think ? Xperias don't need more RAM because of nearly vanilla android experience. Xperia UI is very light, probably lightest OEM UI out there. So you will never face lags in Xperias. I like your preference on vanilla android but unfortunately Sony's UI is not even close to that. Moto has taken better approach with better pricing and package. If anyone wants a X Compact they should just order it from Clove in England. With the exchange rate, the price is only $415 + shipping. No waiting and you get a working fingerprint sensor. Just make sure it will cover the network bands that you need. + don't count on having a valid warranty. do you even VAT, m8? full price inc. VAT is 379 gbp, just a bit under 500 usd. Hahaha I knew it would be way overpriced compared to the competition. They just have way too many overheard costs. It is funny and ridiculous together. Has a fingerprint sensor, just takes 5 minutes to enable it through firmware change. Just connect it to your computer and download UK firmware on it, done. No warranty voided, no issues, fingerpring sensor will be fully enabled and working on your US XZ. Pretty surprised to see there are few still interested in Sony smartphones, perhaps just Sony fans. It has become obsolete in Asian countries due to variety of choices here and no one talks about Sony smartphones here. The price is quite high for its specs and there's nothing special in it compared to other smartphones at this price range. Those prefer vanilla android would go for Nexus or Moto (which has started to gain traction recently). I'm just wondering why they haven't wind up their smartphone business as they announced some time back. That's incorrect now. The Xperia XZ beats the Exynos S7 Edge in speed tests with just an 820. That's called excellent software optimization. https://www.youtube.com/watch?v=DW2Zkz_zl-o It only lost in boot test but won in all app opening speed tests.